Pallet racking provides the affordable warehouse storage solutions businesses need to remain effectively organized. Please call (713) 957-1111 to receive the best level of service and pricing for any pallet racking system, industrial storage system or shelving system today! We’re aware that there are many issues that are constantly changing and are related to warehousing matters and business operations storage facilities that many companies are currently faced with. These many variables that business owners face in modern warehousing, creates the need for better, more effective solutions for matters related to storage space and shelving. As an exceptional storage solution, many business owners have found great benefit in obtaining new or used pallet racking from Shelving Concepts. Shelving Concepts provides large companies and smaller businesses with effective Pallet Racking solutions for meeting the storage needs of all warehouses, distribution centers and other related facility types, regardless of the size of the facility in need of organizational shelving. Shelving Concepts has the experienced staff that thoroughly understands the shelving and storage requirements of each individual business and industry type. We will be happy to discuss your unique needs and to make pallet racking recommendations that will be best suited for your precise requirements. Shelving Concepts has been installing Racking and Shelving Solutions for over 20 years and continues to be a leading Houston pallet rack manufacturer and distributor of pallet racks. The material handling storage shelving system pallet racking, is designed to store materials on what are called skids, or are also called pallets. There are a wide variety of pallet racking options to choose from and all types allow for the storage of palletized materials in horizontal rows with multiple levels. All types of pallet racking create some level of increased density in storage capabilities. The rack options that include the lesser amount of density are often the lower priced pallet racks. Increasing storage density percentages may increase the price, but in the long-run and when choosing the most effective new or used pallet racking solutions may reduce overall cost significantly. The lower density level of pallet rack includes selective racks and the higher density levels of pallet rack capabilities are covered by flow pallet racks. Most pallet racking systems require the use of forklift trucks. The use of forklift trucks is generally a requirement in order to place the loaded pallets onto pallet racks for storage. Warehouse racks and drive-thru warehouse racks include whether the bays have an entry at only one end, or have an entrance and/or exit at both ends. Drive-in rack systems use a common entry and exit, while drive-thru systems have entry points at either end of the bay. Because a drive-in racking system has only one entrance, it uses what is called a last in, first out (LIFO) storage racking method. With only one entrance, the last pallet rack put into a row is necessarily the first one to be taken out. A drive-thru storage system, with two different entry points, can also use a first in, first out storage method. With a system that is a FIFO pallet racking system, pallets are loaded in one end and are pushed back to the other end. At that point, they are then at the front of the row on the opposite side. The first pallet rack put into such a row with a FIFO system is the first one taken out at the other end. This pallet rack system has many advantages for materials stored that have a limited shelf life of any kind. This depth arrangement of push-back pallet racking systems reduces aisle space, while increasing storage density for warehouses. For push-back pallet racking systems each bay can be up to six pallets deep. Push-back pallet rack systems are designed around the principle of organizing space by depth rather than width. Each pallet is stored on wheeled carts that fit onto rails. The rails are slightly angled toward the load and unload side of the warehouse rack in order to take advantage of gravity and to save enormous amounts of energy for moving heavy pallets. Pallet Flow systems are high density pallet warehouse rack storage systems that utilize depth to increase capacity. This warehouse racking system uses a slightly inclined rail with rollers allowing pallets to move easily along a sloped plane. These systems are also called gravity flow or dynamic flow systems. Pallet Flow racking systems are either a first in, first out system or a last in, first out storage system. If the system is loaded from the back and unloaded from the front, it is then a FIFO system. If the system is loaded and unloaded from the front it is a LIFO warehouse rack system. Affordable options for pallet racks include selective pallet racking systems as they are often considerably less expensive per pallet position than their higher density pallet rack system counterparts. In most medium to large warehousing and distribution facilities, however, high density pallet rack systems are essential, as they provide time efficiency as well as high cost facility space that is much more optimized. 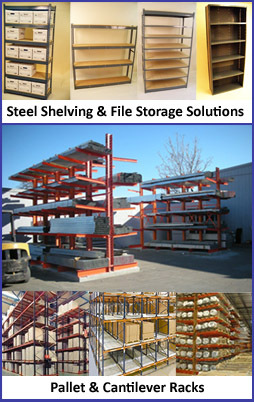 Additionally, Shelving Concepts also provides used pallet racking systems to meet your company’s budgetary needs. In many scenarios, companies need to consider the most cost-effective storage solution to their warehousing and large business operations storage facility requirements. Please call Shelving Concepts at 713.957.1111 to receive exceptional service and pallet racks today!